The Blackmagic URSA Viewfinder uses a built-in sensor that turns the screen on when you're looking through it. It screws directly onto the top of the URSA cameras and can be adjusted for either eye. Please note that this viewfinder is designed specifically to work with the Blackmagic URSA 4K Digital Cinema Camera for PL Mount and the Blackmagic URSA 4K V1 Digital Cinema Camera for EF Mount. It will also work with the Blackmagic URSA Mini 4.6K Cinema Camera for EF Mount and the Blackmagic URSA Mini 4K Cinema Camera for EF Mount but only when used with the Blackmagic URSA Mini Shoulder-Mount Kit. Your URSA must have a top handle to mount this viewfinder to and the URSA Minis do not come with one. Plan accordingly. 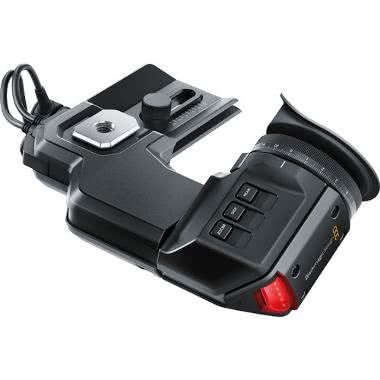 • This viewfinder is designed specifically to work with the Blackmagic URSA 4K Digital Cinema Camera for PL Mount and the Blackmagic URSA 4K V1 Digital Cinema Camera for EF Mount. It will also work with the Blackmagic URSA Mini 4.6K Cinema Camera for EF Mount and the Blackmagic URSA Mini 4K Cinema Camera for EF Mount but only when used with the Blackmagic URSA Mini Shoulder-Mount Kit. Your URSA must have a top handle to mount this viewfinder to and the URSA Minis do not come with one. Plan accordingly. • This viewfinder accepts a standard SDI connection and 4 pin XLR power for use with other cameras but experimentation is at your own risk.